In File Explorer in Windows 8.1, you select files to move, copy, rename, or delete. You can add a check box to make selecting multiple files easier. 1In Explorer, select the View tab, and then select the Options button. The Folder Options window appears. 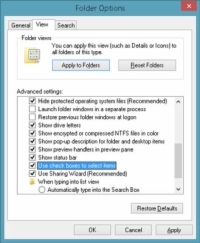 2Select the View tab (in the Folder Options window, not in the Explorer ribbon). Scroll through the Advanced Settings box until you see Use Check Boxes to Select Items, and then select that check box. Select the OK button. 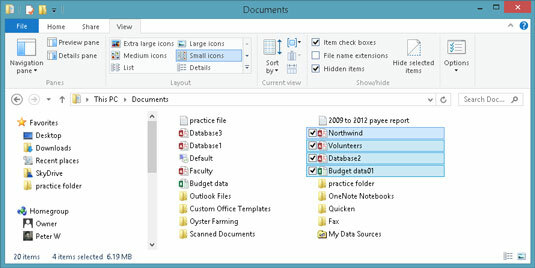 3Select the Documents folder (or any folder that contains more than one file). 4Repeat to select additional files. 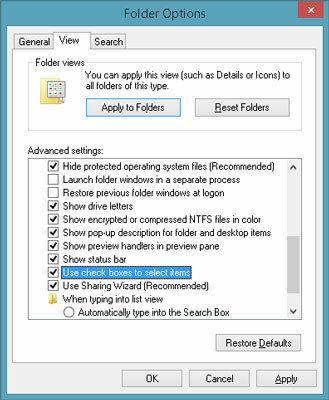 If you want to deselect a file, select the check box again to remove the check mark. 5Close the window after you've seen how these check boxes work. If you want to select only a single file, you can select anywhere on the file name. You use the check box when you want to select more than one file at a time. The Home tab has other methods for selecting. Select All does just what it says — selects all objects in a folder or library. Select None works similarly. Invert Selection switches the selection.